I remember the day I quit working full time; I walked into the public relations agency I was working at and with a mixture of fear, nerves and excitement I handed in my resignation. Straight away I felt a huge weight lift off my shoulders and the frown I had been wearing on my face for months instantly turned into a smile. What next? To create an inspiring workspace at home. With two weeks until I was officially self employed, I started collecting inspiration from Pinterest and interior magazines to help pull together ideas on how I wanted my workspace to look like, and most importantly, function. My workspace at home is my sanctuary; it's the one place where I am extremely productive. 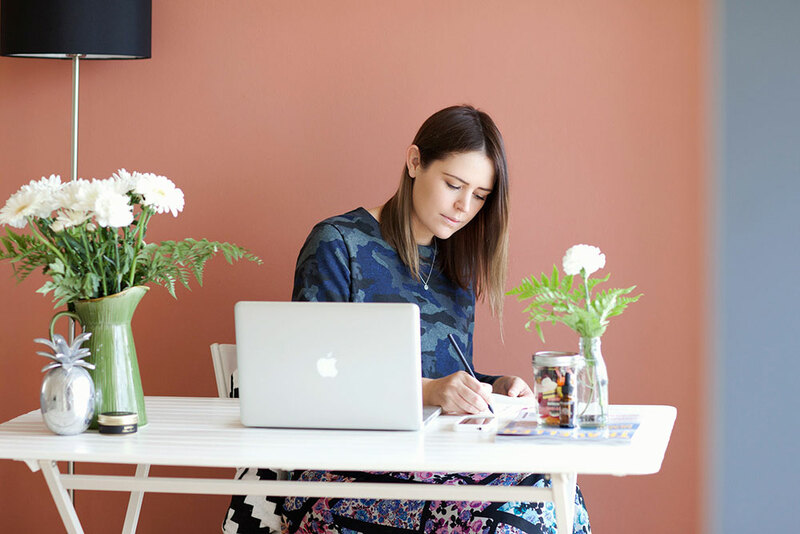 Whether you're setting up a new business at home or making a few changes to your current workspace, it's so important you create the ideal working space - for you. What may work for me may not work for you. You just need to make sure that your working space is productive and aesthetically pleasing. There are many factors you need to consider when designing the perfect space to call your office, so I have pulled together 6 simple steps to creating the perfect workspace. These photos were taken last year, and my workspace has evolved over time, but I think it's a great example. Plus you'll be so surprised when you see the difference a bit of thinking and time spent into making your workspace can do for you. So kiss goodbye messy, unorganised desks with these quick tips below. CHOOSE THE RIGHT COLOUR PALETTE The colour of the walls surrounding your workspace is critical to productivity and peace of mind. Not everyone is the same as me however bright, warm colours work best. I personally love white and use art to bring colour and texture into my workspace. I highly recommend staying away from dull colours as they lack inspiration and might give you the Monday blues - we don't have time for that! INVEST IN GREAT LIGHTING You can't beat natural light, it's by far the best. Where possible, your workspace should have fantastic natural light and a view, so move your desk to a window or glass door. Without this, your space can feel dull and depressing. Although sometimes we don't have those luxuries, so if you don't have great natural light, invest in good desk lighting. GET A GREAT CHAIR It's so important you get a great chair for your workspace. Not a good chair, but a great chair. When you don't pay attention to your back, your chair can take a huge toll on your mood, general health and inevitably, your productivity. Who wants to be worrying about a bad back when you could be spending that time growing your business, or planning your next holiday! ADD LOTS OF GREENERY I literally cannot work unless I have some greenery around my workspace. I am a huge indoor plant fan, in fact I have about ten indoor plants in my two bedroom apartment alone. Not only do indoor plants purify the oxygen in the air, they improve the look and feel of a workspace and have been proven to lift people's mood. If you're a bit of a green thumb novice, I highly recommend Bird of Paradise and Peace Lily's. Fiddle Leaf Figs are also amazing, but pretty tough and expensive to come by in certain parts of Australia. These three indoor plants are super tough (and loyal); they won't wilt or die if you sometimes, and only sometimes tsk tsk, forget to water them every few days. GET RID OF CLUTTER I firmly believe there are two types of people in the world - those who work in organised chaos and those who work in organised organised. I am the latter. The less clutter on my desk, the less cluttered and distracted I feel, and the more work I get done. I've seen some really cool workspaces on Pinterest in my time with lots of magazines, wall art, desk ornaments, calendars, coffee table books, files and more filling the space, but this just doesn't work for me. It's too distracting. Regardless if you're like me or not, take a look at your workspace and see what you can bin - be brutal. I promise it'll make you feel so much more productive and creative! CREATE A BREAK OUT HUB As with most professional offices, there is always a break out hub or area for employees to take a break from their desks and give their minds a well needed rest. It could be an inspiration room, a table tennis or a rooftop. Therefore it's essential you create a break out hub for your own workspace. It could be as simple as stepping away from your workspace to watch a bit of television, read a few magazine, play games, listen to music or alternatively, getting outside! I work really well in the mornings and the evenings - my most unproductive time is during the afternoons. So when I need a break in the mornings or the evenings, I'll usually read and enjoy the views from my deck overlooking Gordon's Bay. But when I usually have a slump in the afternoons, I get outside for some fresh air either to exercise or I jump in the car and run errands. Do you have any tips for creating the perfect workspace? Do you have an organised chaos workspace or an organised organised workspace like me? Would love to hear your thoughts!